The Senate’s budget includes costly tax cuts that proponents claim are targeted towards middle class taxpayers. The tax cuts will cost $324 million for the upcoming fiscal year and will balloon to more than $800 million within five years. Rather than targeting middle class taxpayers, the proposed tax cuts largely benefit the highest income earners in the state and profitable corporations. 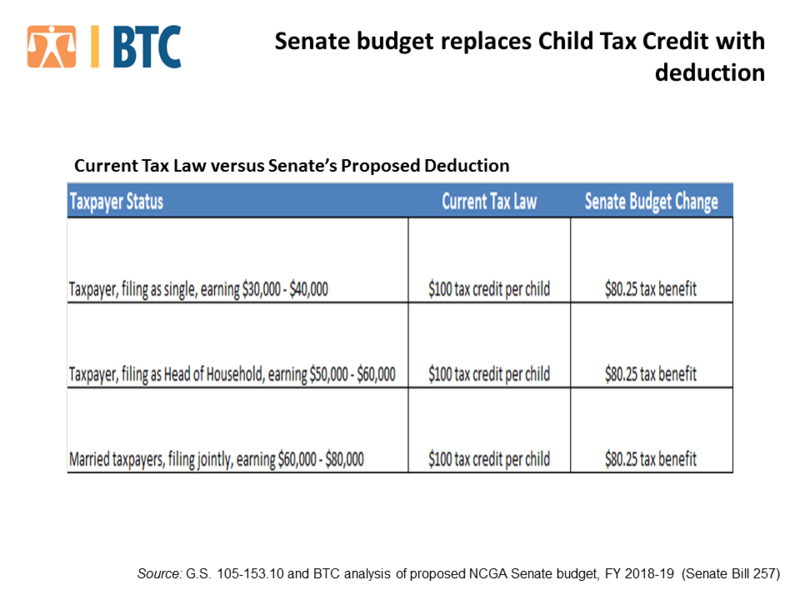 The proposed change to the existing Child Tax Credit included in the Senate’s budget makes this reality clear. Eligible taxpayers with dependent children currently get a tax credit of either $100 or $125, depending on the taxpayer’s income level. The Senate’s budget replaces this tax credit with a deduction, which allows the eligible taxpayer to deduct a portion of their taxable income. Under this tax change, middle income taxpayers will fare worse compared to the Child Tax Credit under current law. Under the existing tax code, single filing taxpayers with adjusted gross income between $30,000 and $40,000 get a $100 tax credit for each child. Under the Senate’s budget, the proposed deduction equates to an $80.25 tax benefit for these taxpayers (under a reduced income tax rate of 5.35% included in the Senate budget). Under the existing tax code, taxpayers filing as Head of Household with an adjusted gross income between $50,000 and $60,000 get a $100 tax credit for each child. Under the Senate’s budget, the proposed deduction equates to an $80.25 tax benefit for these taxpayers (under a reduced income tax rate of 5.35% included in the Senate budget). Under the existing tax code, married taxpayers filing jointly with an adjusted gross income between $60,000 and $80,000 get a $100 tax credit for each child. Under the Senate’s budget, the proposed deduction equates to an $80.25 tax benefit for these taxpayers (under a reduced income tax rate of 5.35% included in the Senate budget). The examples highlight that this proposed tax change in the Senate budget makes middle class taxpayers with children worse off, not better. As the saying goes, the devil is in the detail. For more news and analysis during the budget debate, follow the Budget & Tax Center on Twitter @ncbudgetandtax.